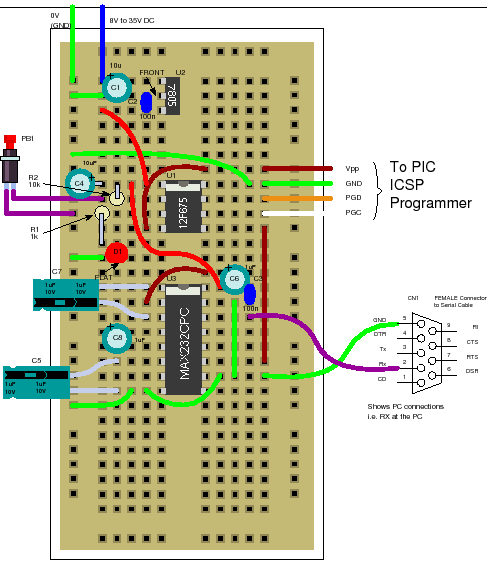 12F675 tutorial 3 : Adding a PIC Serial port. Here you can find out how to add a PIC Serial Port circuit to the 12F675 microcontroller tutorial circuit (you can use it on any other PIC devices, even a 16F84 as it uses a software implementation of the transmit part of a USART). Jump to Soft USART Transmit. Jump to I/O Usage summary. Jump to Recovering lost calibration. The 12F675 does not have a built in USART that you can use for a PIC serial port so you have to use a software USART which you can download from this page. Adding a pic serial port connection to the circuit gives you scope for much more interesting projects as you can collect data from the ADC (inputs) or comparator or external infrared receiver module etc. and transmit it to a PC. This tutorial covers creating the software Transmitter (TX) part of the USART as this is the most useful part of a USART and you don't really need the receiver unless you want to control the microcontroller via a serial terminal such as Tera Term. I/O Port usage summary PORT register: TRISIO - The port direction register. You can reset bits (low) to define port pins as outputs. You can set bits (high) to define port pins as inputs. PORT register : GPIO - The input/output register. You write to this register to set output pins high or low. You read from this register to read the current value input pins. TRISIO = 0x01; sets bit 0 of TRISIO all the rest zero. TRISIO = 0x04; sets bit 2 of TRISIO all the rest zero. GPIO = 0x01; sets bit 0 of GPIO all the rest zero. GPIO = 0x04; sets bit 2 of GPIO all the rest zero. Note: In other PIC devices ports are labeled alphabetically and they do not use the GPIO name instead they use the text 'PORT'. So the first port is labeled PORTA the next PORTB etc. Corresponding port direction registers are TRISA and TRISB. You can use them in exactly the same way as GPIO and TRISIO. The code for the TX part of the USART is simplified in that it generates 10 bits of serial data with no parity bit. Note: To review how the RS232 pic serial port works click here. Since each bit takes 1/2400 seconds the total time to transmit a digit is 4.16ms. Note: The bit timing won't be exact as the PIC chip runs at 4MHz but it will be good enough for bench top use. The circuit uses the standard MAX232 level translator chip but you could use an SP202ECP which has identical pin out (and is cheaper!) and lets you use 100nF capacitors instead of electrolytic ones. You can also use USB to RS232 or USB to Serial Digital converters and with these you don't even need the MAX232 level converter everything is done at 5V (or 3V3)..
Connect the ground and transmit output to a serial port connector as shown and to a serial cable from it to the PC and it's ready to go. For setting up Tera Term click here. Add the MAX232 Chip and capacitors. Again the pic serial port circuit is easier to see on a schematic. The code flashes the LED 3 times then repeats a message to the serial port. txdata &= ~0x0001; // START bit (=0). delay_us(395); // 2400 simulate to calibrate the loop. The character to transmit is shifted left one bit into the data variable which acts a serial shift register. Using 'data' in this way lets the routine evaluate in a constant time without having to check an index to do a different action so for higher (more critical) speeds it works better. The stop bit (10th bit) is a delay with the output set high. Note: You need to calibrate the loop by timing from SU_Set to the next SU_set or SU_res if you change the baud rate. Note: The advantage of using the hard coded timing is that the routine only takes up about 90 words. The project relies on the accuracy of the oscillator to accurately generate the bit timings for the USART and for this you need to set the OSCCAL value. If you don't need an accurate clock then the part will still work without using the OCSCAL value - it will just be inaccurate. Note: The factory setting of the oscillator is 1% which is good enough. So if you have not overwritten it (easily done) then don't change it. The OCSCAL value is located at the end of memory in normal Flash programming memory space - This is a problem since it can be easily overwritten by accident. MPLAB X protects this memory location so it tries not to overwrite it. Inevitably though, if a programming action is interrupted then this value can become corrupted. In that case you need to be able to program it back and this is super difficult! ...or use an existing hex output file from a C project. Note: It is not worth trying to code the value into the C source as it will use a non-standard method of programming. Alternatively download winpic800 (look online to download it) and set the device to 12F675, load up the hex file and go to the memory location in winpic800 and type in the last location the value 34 followed by the CAL value you have previously stored. Save the file. Note: If you have lost the value see section below. After setting the CAL value into the hex file (as above). Create a pre-built project with your device (12F675). In MPLAB X Select Menu File-->Project Properties. Click your programmer (mine is PICkit3). In the top dropdown box select: Program Options. Tick the check the box labeled "Program calibration memory". Now program the device as usual. Then view program memory Menu: Window-->Pic Memory Views-->Program Memory. Scroll to bottom and check the CAL value at the last location. Now go back to the project Options and turn off "Program calibration memory" which will now be protected (until you lose it again!). You can check it worked by re-building the original hex file (so the manually inserted CAL value is lost). Re-program this new hex into the PIC. Then upload the hex data. View memory as above and scroll to bottom - the new CAL value will be there. Only the upper six bits are used as the calibration bits so values must be different by 4 to change to the next OSCCAL setting e.g. values 32,33,34 and 35 would give the same frequency setting. Microchip calibrates the 12F675 microcontroller and places a calibration value at address 0x3FF. This is a RETLW instruction that returns a value when CALLed this is the value to use in the OSCCAL register. You have to write and use a routine to set the register OSCAL with the stored value : It is not done automatically for you! All this does is call the location that contains the RETLW value which then returns the calibration value. This assembler code is packaged into the get_set_osc_cal() routine and does the OSCCAL setting for you. Note: If the value stored at location 0x3ff is zero the oscillator may not work so -don't call this function if the CAL value is corrupted. If you loose the calibration value then you'll need to re-calibrate - the best way is to set the internal clock at an output pin (Fosc/4) using the chip settings so you will be looking for 1MHz at the clock out pin. Use a frequency counter to measure the output (you can find a project on this site here). Change the OSCCAL value until you find the one closest to 1MHz. Note: See the tip for storing the calibration value so you will never forget it or loose it again.